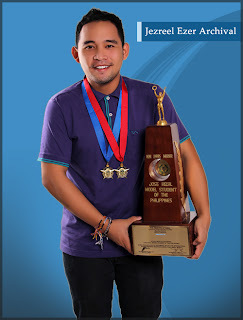 University of Cebu Banilad Campus student Jezreel Ezer Archival bagged the much coveted title as the Most Outstanding Jose Rizal Model Student of the Philippines 2013, besting 200 other applicants from schools and colleges all over the country. Awarding was held at the Knights of Rizal International Headquarters last December 30, 2012 with Special Keynote Speaker Mayor Alfredo Lim, making it a proud moment for his family and UC community. The 25th Search for Ten Outstanding Jose Rizal Model Students of the Philippines was organized by the Knights of Rizal to recognize ten (10) outstanding college students of the Philippines who best epitomize the Rizalian qualities of academic excellence and leadership in campus and community activities and the Rizalian virtue of love of country, thereby serving as living models to the youth of the land. Each university / school can only send one nominee or candidate to the selection committee with criteria for final selection as follows: Academic Excellence (35%); Community Involvement (15%); Student Leadership and Co-Curricular Activities (20%); Final Interview (30%). From over 200 applicants this year, twenty finalists were selected and were scheduled for a Final Interview last December 29, 2012 at the Knights of Rizal International Headquarters. A breakdown of twenty finalists comprised six from Luzon, four from the National Capital Region, nine from Visayas and one from Mindanao. The Board of Judges then selected the Top Ten out of the twenty finalists who were given the prestigious title as the Ten Outstanding Jose Rizal Model Students of the Philippines. The first of the ten awardees was given the title of Most Outstanding Jose Rizal Model Student of the Philippines. Winners were given a certificate of recognition, a medal and a trophy. Archival ranked highest among the ten finalists with ranking as follows: 10th – Jose Mari Pineda (Polytechnic University of the Philippines); 9th – Mary Allysa Jenica Sariba (University of Nueva Caceres); 8th – Francis Almaquer ( University of the Philippines – Visayas); 7th – Mark Solis (university of the Philippines – Diliman); 6th – Nikaela Katrina Gamboa (De La Salle – Lipa); 5th – Gabriel Ignacio Alejo (Ateneo de Manila University); 4th – Sandra Jane Soon (Cebu Institute of Technology – University); 3rd – John Michael Lava (Far Eastern University); 2nd – Javier Rugiera (Ateneo de Naga University); and 1st and Most Outstanding Jose Rizal Model Students of the Philippines – Jezreel Ezer Archival (University of Cebu – Banilad). Jezreel Ezer Archival is a fourth year Bachelor of Science in Business Administration student at UC Banilad who was part of the UC Team that gained the title of National Champion of the Food Category and 1st runner up of the Non-Food Category in the 2012 Philippine Chamber of Commerce and Industry (PCCI) 6th Best Business Idea and Development (BIDA) Award for their projects “Hanging Rice” and “Mango Seed Kernel Oil”. On the first week of November 2012, Mr. Archival went to Germany as one of the 4 representatives from the Philippines for the Bayer (Global) Young Environmental Envoy. When he came back from a week trip from Germany, he received a letter from the Office of the President informing him that he will be one of the delegates picked by the National Youth Commission to go to Japan for another social project. UCnians Peace to all! Universityofcebu.net need site writers, if you are interested to become part of the site please email us at uccebu@gmail.com. This is our UC Community Site. Thank you! Universityofcebu.net is a UC Community Network Site. All articles and photos publish on this site are those of the writers and no intent to violate the copyright law, this is only for promotion. For query/question about school university, please click contact us!